I was asked to lead a discussion about new monasticism in Sunday school class last week, and it was for a class I’d never visited. As they went around the circle to introduce themselves to me, I discovered that many of these folks had been members of our church since before I was born. I am not exaggerating. Every single member of the class was at least a grandparent twice over, to help you get some perspective on the demographic. There’s irony here, I think, in that I was leading a discussion about new monasticism, but that’s not what I’m going to talk about. The other two places I lived since leaving “home” were both havens for transient people because of the nature of academic settings. When you’re all transient, you all have a “home” base to go back to. You tend to leave at the important moments, rather than stay. you don’t have to plant your roots, even as you build community, because you always know you have roots somewhere else. It’s like gardening. (One of my friends likes gardening metaphors, so this is for him.) Last fall, my husband built some cold frames for us, and we somewhat idealistically believed we’d have lettuce and spinach through the winter and onions and cabbage in early spring. We didn’t plant them as early as we should have, and the natural world did not cooperate when we got long-lasting frigid temperatures in December. (Even with the sun, the temperatures in our cold frames weren’t getting above freezing.) Then came the snow. And more snow. And more snow. But this week it got warm. At first, we ignored the cold frames, didn’t even open them, like you’re supposed to during the day so you don’t bake your plants. The lettuce had gotten slimey back in the winter, which I would assume is not very promising, though I’m no green thumb. But then on Wednesday I opened them. It was pretty steamy in there. Thursday was a busy day, and it wasn’t until Friday that I went out to investigate again. I walked over to cold frame #1. Miraculously, the spinach survived. Yeah but, I thought, it’s hardier than lettuce. So I walked over to cold frame #2. Weird. The lettuce didn’t look so bad either. I squatted down to take a closer peek. It was kind of crisp, so I tore off a leaf of it and tasted it, prepared for it to be bitter. It wasn’t. It tasted like baby lettuce. It won’t be a big harvest, but we’ll get something. You see, I’m learning a lot about community here, and the main thing I’m learning is that I don’t need to “generate” it. I need to live it. I won’t always see what’s happening under the surface. I don’t know what I’m planting, what winter’s going to be like, and what the leaves might taste like come spring, but that doesn’t mean something’s not growing. Oh yeah, and deciding a little late in the season to start a garden is not an excuse not to plant at all. So back to that Sunday school class: these folks had roots, deep roots, roots deeper than my entire life. My entire life. I’ve only been here three years. A few hours before the temperature dropped on Tuesday night and the rain turned to big, fat snowflakes, we found ourselves dreaming of summer. We’d spent the last few weeks flipping through our favorite heirloom seed catalog, circling the varieties we might want to purchase and dog-earing entire pages we wanted to revisit. On Tuesday, we compiled our final list, discussing logistics of what we could reasonably manage to grow this year in our own garden, trying to be realistic about the amount of time we could devote to decorative and edible landscaping in the side flower beds we’ve mostly avoided in previous years, and brainstorming for a smaller relatively hands-off plot in our church’s community garden. So much to think about. 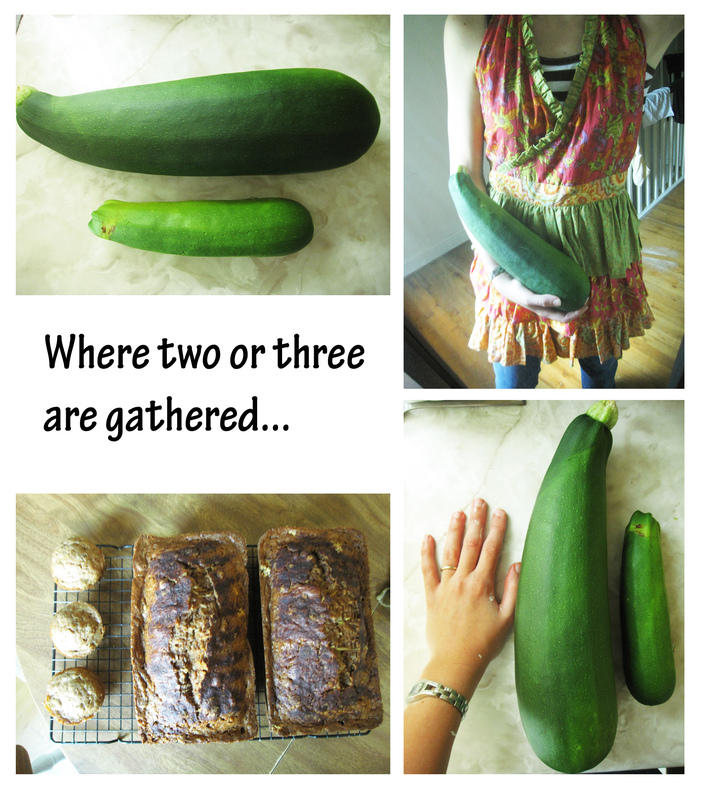 What would get sown inside in coming weeks versus what could wait to get planted outside? What would work best for companion planting to save space and enhance the nutrients of our soil? So much to look forward to during this week of winter weather advisories and electric blankets. There’s much to be said about gardening as a metaphor. It’s all over the Bible, especially in the parables of Jesus. It’s a metaphor for spreading the gospel, a metaphor for the health of our souls, a metaphor for the way we need to live in community with one another and with God. I am the vine, Christ tells us. You are the branches. The harvest is great but the laborers few. Faith like a mustard seed. Vineyards. We’ve got gardens at the beginning, gardens at the end, gardens in the middle. Seeds sown in all kinds of soils. Certainly the practice of saving heirloom seeds is a metaphor for something. Certainly the fact that we sat and planned our garden in the face of temperatures dropping radically outside and a wintry forecast headed our way could be a metaphor for something, too. 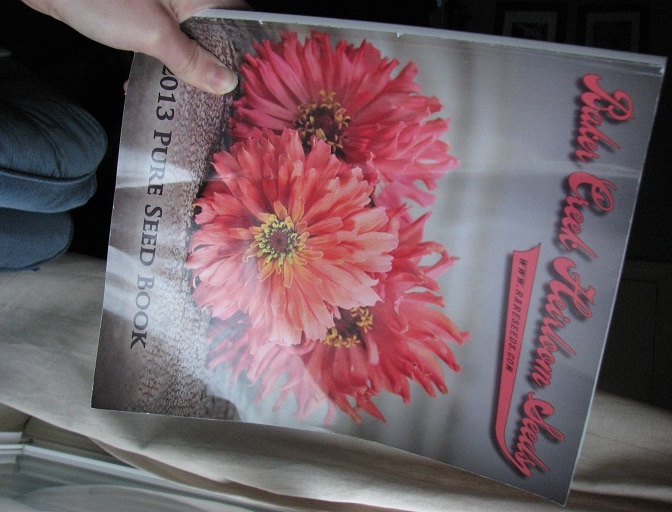 I love our heirloom seed catalog. So… remember how I mentioned we had a rabbit (and a snake) that lived in our backyard? The snake had actually taken up residence in our basement temporarily but was removed to the yard by a brave husband. So no worries there. The rabbit on the other hand, which has grown quite large, was a bit of a worry when we transplanted our lettuce, spinach, and cabbage babies, so the husband put up a fence around the garden. Unfortunately, we realized he’d put the wire part on upside down, so that the bigger gaps were at the bottom–plenty of room for a rabbit to squeeze through. But fortunately, this rabbit is a strange creature, and likes to perch itself just outside the fence, and sneak its head in through the fence to eat the clover and weeds growing on our garden path, but not venture into the garden itself. So, as it turns out, no worries there either. A week or two ago, our housemate commented on the rabbit, which she can see on a regular basis out her bedroom window. She likened our yard to a “menagerie,” which seemed like an exaggeration. I mean, it’s just a rabbit and snake. Yeah, yeah, sometimes we have neighborhood dogs meander through, chased by their owners, and sometimes the fat white cat named Sugar who belongs to the older woman across the street hides out in our shrubs, but still. A menagerie? I knew I was to have a meeting at church today from 3 until 5 pm and, as a result, was not whelmed at the prospect of changing into grubby clothes, slathering on sunscreen and bug spray, and heading out to our church’s community garden at 6. I knew we had fruit trees to plant, tomatoes to pick, pepper to water, and weeds to pull, but well, I just didn’t want to. So I decided I wouldn’t. Then, in church this morning when we heard from Matthew 16 (vv. 21-28, actually), something stood out to me. This: Then Jesus told his disciples, ‘If any want to become my followers, let them deny themselves and take up their cross and follow me.’ And wouldn’t you know it, our pastor mentioned in passing–it wasn’t even the main point–that it isn’t easy to “deny ourselves,” not if we take it seriously. Because denying ourselves doesn’t mean giving up things that are easy, giving things up that are abundant, giving out of the excess. It’s about giving out of what is important, crucial, life-giving. Ah geez. What says community more than this? 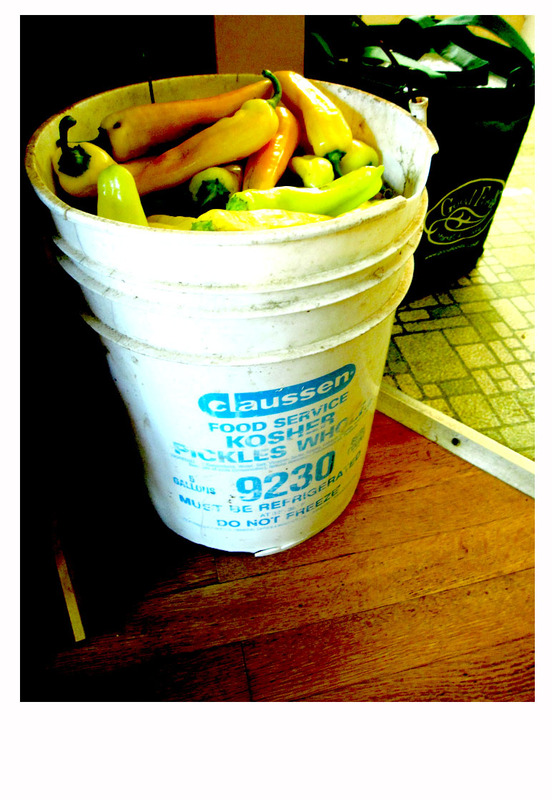 Yep, that’s a five-gallon bucket full of hot banana peppers. You see, a few weeks ago, a friend dropped off a gallon Ziploc bag full of peppers, along with a 4-ounce jar of sweet hot mustard she’d made. If you want the recipe, let me know, she wrote on a note attached to the Ziploc. We tasted and saw that it was good, so we asked for the recipe and ended up with 24 of our own 4-ounce jars of goodness. Christmas presents, we thought to our frugal selves. A few hours later, this was in our dining room. * Without access to Facebook at the moment, this entry will have to suffice today for Facebook Photo Fridays.